Due to popular demand, Rev. 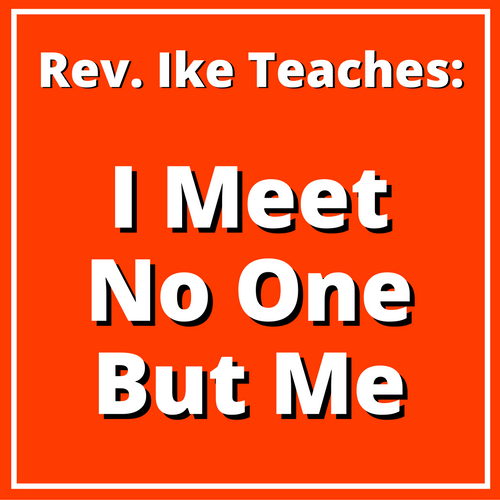 Ike's classic teaching "I Meet No One But Me" is now available as a downloadable 1-hour audio MP3! You may be wondering what on earth Rev. 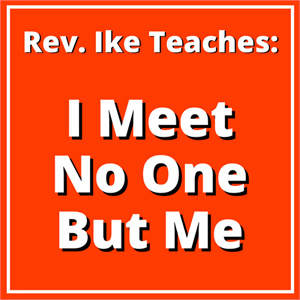 Ike means by "I Meet No One But Me,” because it's a very mystical statement that may set you reeling for a while. But this teaching will have many practical applications — and once you understand it, you can apply this lesson to control people, circumstances, and conditions in your life! In this powerful, mystical, eye-opening 1-hour teaching, Rev. Ike explains that "the people and conditions in my life are such as they are — because I AM such as I am." You cannot experience anyone or anything outside of yourself, except those which correspond to something within yourself! You'll understand this hard-to-swallow truth, that "Every time someone or something outside of you needs changing, you must go to yourself and make the change within yourself!" As you listen to this teaching, Rev. 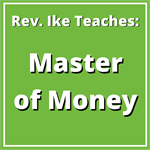 Ike may set you back on your heels as he reveals and explains these mystic secrets of mind science. Your subconscious self-concept is always being made flesh, not only as your physical flesh, but as the flesh of the other people in your life. The only thing you can get is what you give, because there’s nobody else that can really give you anything but yourself. You are always getting what belongs to your subconscious word, to your subconscious self-image. You Are Always Getting What You Are! 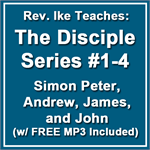 Deep, mystical, and rich with meaning, this MP3 lesson is best understood and appreciated by those who are already somewhat familiar with Rev. Ike's teachings! (Not for the beginner!) You'll need and want to listen to this lesson more than once, and each time you listen, you become more deeply conscious of these truths that transform you! How to attract the right kind of people in your life! 2 Magic Words That Change Everything! "You are playing every role in the drama of your life," teaches Rev. Ike, and in this lesson, he explains the power of those two magic words, "I AM," and how to use the "Law of I AM" to unmake the circumstances that you don't want — and to create the life that you do want! "When the student is ready, the teacher appears." Are you ready for this eye-opening lesson? Order the MP3 ($9.95) now for immediate download and start to turn your mind and your mouth around — and turn your life around! Total length: 1 hour 4 minutes.